In which the writer accidentally enables the murder of the English Romantic rural dream by an anarchic conservative. 5.00 am. Monday morning in Sauchiehall Street, Glasgow is far removed from the meadows and rivers of Constable country. The gamblers hover round the cheap casino near Charing Cross, the last drunk stragglers head home and the first workers of the day trudge through the dark to early shifts. Overhead the seagulls call to each other and wheel around under-lit by the streetlights. I regularly see them at night unnoticed and coldly sizing up the revellers below who carry on oblivious to what’s above them at roof level. There is a sinister purpose to the flights of the gulls, as if on a signal they will swoop to attack the revellers with sharp beaks ripping out chunks of flesh. The train journey south passes by in restless dozing and I awaken to the Lake District passing by in a monochrome blur of stone walls, bare trees, dark waters, farms, trees etched onto snow-covered hills and valleys. By the time we arrived at Euston the train system is imploding. On the main concourse a sea of hundreds of faces are anxiously upturn to a departures board rapidly emptying of promise and order. The announcer mournfully works his way through a litany of cancellations as if he is about to play Last Post to for lost and fallen train journeys. An elderly couple silently sit dazed in a mobile cart abandoned by the driver, maybe they realise they are more likely to reach their final destination that day then their intended one. The willows, mills, rotten planks and slimy posts of Dedham Vale gave the English Romantic painter John Constable an intense affection for a landscape he once told his wife he regarded as his mistress. He was a quiet revolutionary at the time painting in a free manner directly inspired by what he saw in front of him. He refused to paint romantic and exaggerated visions of wild landscape instead preferring mundane but true scenes of life set in beautiful pastoral settings. Like other British artists he was more appreciated in France and inspired both contemporaries and later the impressionists. Chasing Constable through the Stour valley is not difficult. The squat tower of the 15th century Dedham Church that appears as recurring landmark through Constable’s paintings still rises above the picturesque village and treetops as a constant visual reference throughout the valley. You walk through the same meadows and trees, the paths wind with the river in the same way, the mills still churn and thrash the water. These are the same scenes that Constable spent his “careless boyhood” and made him become a painter. Feeling and loving the landscape that day was another matter. I wondered how Constable needed to love his landscape, and whether he chose Dedham Vale or the vale chose him. It was something I pondered as I trudged about the muddy, sodden fields of someone else’s love, thinking how one person’s fascinating mistress could be tedious to another. It didn’t help that where I picked up the walk near Manningtree train station the traffic thundered by. Nor that the sky used its expansive wide canvas to express one hue of leaden grey that drooped apologetically low overhead. Nor that the slippery river path threw me up and slamdunked me into a muddy puddle. Or that the interplay of shadow and light, cloud and sky, an interplay that provided so much vigour and life to Constable’s paintings, had been blunted to such flat affect. Even so, the subtleties seem to be beyond to me, to the point where at times it was a bit dull. It was on my approach to the Flatford that I partly realised what was missing when a party of children nosily and cheerfully walk across the field to some unknown purpose. Constable’s paintings are full of life, be it boys fishing, farmers working the fields, people on boats or a boy drinking from one of the Stour’s tributaries as his dog, slightly exasperated, watches over the sheep. There was no life here in the fields or in the village. Even Dedham, though pretty, lacked atmosphere like so many English villages and small towns where the bustle of trade and work now happens somewhere else. The scene of The Hay Wain, regarded as one of Britain’s greatest paintings, was a pretty spot but unlike its famous portrait 192 years ago, where horses pulled a hay wain across the river, it too was lifeless. It was however interesting to see how Constable had truncated the roofline of Willy Lott’s house to fit the composition and how the landscape had changed through this part of East Anglia sinking into the North Sea by around 30 cm, a higher water level and the introduction of an embankment for flood defences. 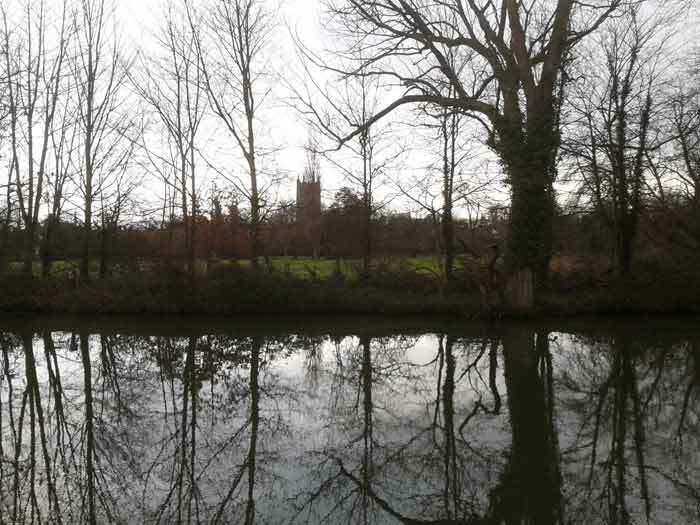 There were glimpses here and there: horizontal layers of river, field, water meadows topped by the squat church tower. Through timber-framed windows a draughtsman could be seen at work on a drawing desk, painstakingly detailing some architectural plan. 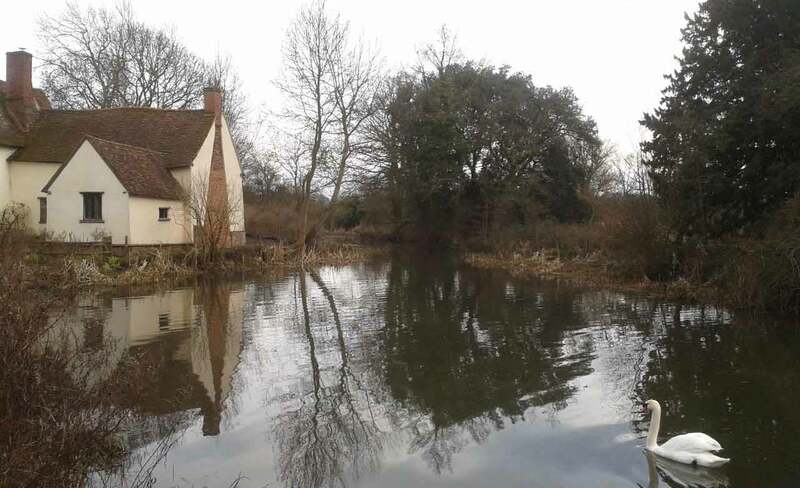 The reflection of trees in the Stour as it elegantly curved around the floor of the valley, a crooked lane, the green lushness of the reed beds and meadows, the brickwork of the old mills, a stout oak waiting for its summer bloom. When finally the sky, the “key note” that “governs everything”, broke its monolithic grey and the sun nearly broke in the late afternoon through you sensed a landscape drawing its breath, desperate to spring into action and illuminate in Constable mode. Instead a dark rain cloud formed, not unlike the one in Seascape study with rain cloud, and not unlike so many in the West of Scotland skies. Both Constable country and I sighed with disappointment. Maybe it was the wrong time of year, the wrong time of week. Perhaps Constable’s greatest genius was to extract something so magical from a countryside so mundane, and show us a world which has not so much disappeared as simply has no modern equivalent. I headed off for the Essex rush hour wondering why everyone was staring at me until I realised I was still splattered with Constable mud, his parting raspberry at my inability to see what he could. That night I was staying with PWC, my second favourite anarchic conservative, the first being my late aunt whose fearsome hourly cries of “gin time” were so impossible to resist. Half of his stories will only be declassified thirty years after his death, few can be reproduced here. PWC is firmly of the old tribe – conservative in the old ways, anarchic libertarian in that rules are not for him. He speaks for the old English vices of liberty, excessive appetites, gambling and the great outdoors of hunting, shooting and fishing. Once his dogs chased down and immobilised a deer. Shouting at the dogs to keep it there he ran-up and in one fluid movement broke the deer’s neck. He looked at the twitching corpse with satisfaction, then glanced up to see he had done it in front of a busy pub of families staring slack-jawed, pints frozen in mid-draw. “He killed Bambi” cried one of the last innocents in Essex. PWC is the old ways, he is home-made sloe gin and a carefully prepared meat joint roasting in the aga. He is rude but well-mannered, brusque but hospitable. He is in a permanent state of outraged war with London, his bank, his stockbroker, himself and the deer who break into his garden and eat his carefully planted oak saplings. In response you will find him sprinting through the fields, clad in nothing more than pants, and boots, waving a shotgun about and roaring curses at the night. When he goes to London he single-handedly takes it on without fear. London always defeats him with parking tickets, misdemeanours caught on CCTV and bureaucracy. What sets him apart is he won’t back down in the next round. He never backs down. He’s tipped me white-faced and trembling on an early morning train reeking of vomit, whisky and venison with a presentation to give in two hours. One friend begged him never to change as, confounded, PWC inadvertently bellowed at an impudent waiter that surely this white port was actually a sherry by any judgement of taste. As if the honour of all the maids of fair Albion was at stake. He never will change. English soil runs through his veins – it is his livelihood, his life and the food on his table. When you consider PWC, Constable and my aunt for that matter you have to marvel at the genius of a country that produces such characters. So when the malts and port entered stage right I made a fateful mistake. Maybe the day could be rescued, maybe Constable’s pastoral dream could be found here despite the fact on a quiet day in his fertile garden you can just hear the jet engines revving at the airport (another battle lost, another London jackboot stamp on England’s green, another sacrifice for modern convenience I can’t deny I have freely used. Naturally PWC was here long before the airport was). I quoted Constable in my make or break question. Cue shouting abuse at each other as has been the way for some time. He’ll deny everything and he’ll escape by some ancient by-law that the lawmakers have forgotten to abolish. He’s got previous on dodging previous. Whatever the case the dream is over. It’s time to move onto the next phase, enduring a dull London, with a throbbing headache and dried mouth. A London of purposeful meetings run to points of time, in hushed air-con committee rooms, drying sandwiches and stewed coffee. The sentimental call of old haunts and a multitude of sirens beckoning from new things will press in from all around, taunting me. I will be so sunk in boredom that for entertainment I will indulge in unspeakable mind games. This is how the British produce brilliant characters, sports, musicians, inventors, poets and writers – the long dull beat of the clock, stifling committee rooms, grey clouds, suburbs, rain and disappointing countryside. Meanderings strangely reminiscent of Whitnail & I. What now for Albion as Uncle Monty is no more? It’s history boys. Ha ha – that film is probably always at the back of my mind for these times. Don’t forget he’s Uncle Vernon as well. Wonder how old the kids should be before I can introduce them to Uncle Monty. Many thanks teigl. Love that story about the train driver. Family myth has it that my grandfather or some long gone member of the family used to tip the train driver for getting him to his destination safely, so convinced he was that there would be an accident. As I said before Withnail and I is always in the back of my mind when I write this kind of piece and PWC is something of that flavour.